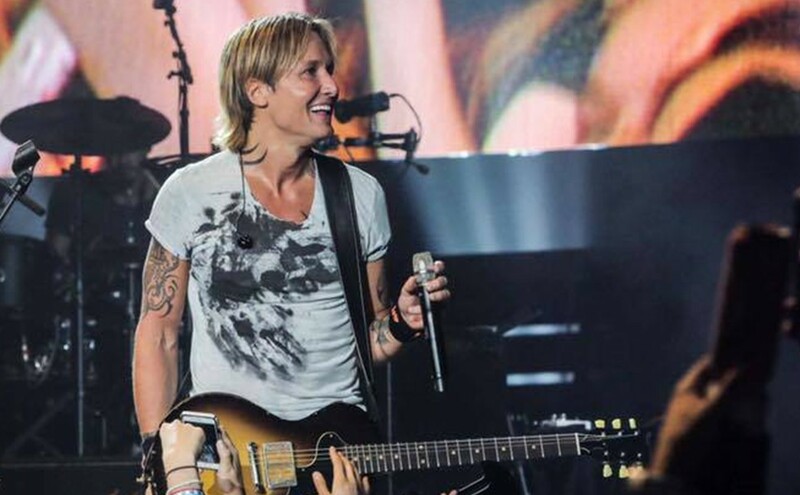 Six-year-old fan can stop wishing upon a star to meet his favorite country music artist after Keith Urban's concert in Allentown, PA.
Dreams came true for Keith Urban‘s number one fan on August 30th, in Allentown, PA. While Keith is known for bringing fans on to the stage to be in the limelight, he created a long-lasting memory for a special fan just a few rows in front of the stage. Six-year-old Liam was finally able to experience a night of a life-time with his favorite artist after many failed attempts to attend one of Urban’s concerts due to health issues. Since birth, 6-year-old Liam has been dealing with a rare disorder in which his internal organs were located outside of his body. Because of his special case, Liam has had to endure countless abdominal surgeries and many visits to the pediatric intensive care unit (PICU), along with spending almost the first two years of his life in the hospital. The seemingly endless hours in the hospital lead Liam to become familiar with Urban’s music. After 22 months of living in the hospital came to an end, this unstoppable little boy came through his final surgery and was able to recover enough to see Keith Urban in concert. Liam’s very first concert was a moment to remember, to say the least. The country superstar handed the youngster his guitar pick! That moment where Keith Urban handed my Monkey a guitar pick! ❤️🎸 #keithurban @keithurban thank you for making his night! What an awesome moment to witness. We wish Liam the best as he overcomes his health hurdles. Keith, along with Jason Aldean, Luke Bryan, Florida Georgia Line, and Chris Stapleton, has been selected by CMT as one of the premiere country artists of 2017 and will be celebrated at the eighth annual CMT Artists of the Year special, airing live from Nashville’s Schermerhorn Symphony Center on Oct. 18 at 8 p.m. ET. Just days later, the superstar will perform at Party in The Pines in White Springs, Florida on October 20th. In a recent interview with The Morning Call newspaper in Allentown, Pennsylvania, Urban revealed that he’s working on new music, but don’t expect a new album in the very near future. Creating an album is truly a process for the star— it might come together quickly or take a long, long time. “I’ve just come to the realization that it really doesn’t matter what I’ve done with the previous record — every record is just a new beast. And it may be similar to the last one, nothing like the last one, exactly like the last one, a little bit like the last one. I just never know,” he shared about his approach. No matter what, we appreciate Keith’s craft and his generous heart!